Join the conversation: Should school start times change? School board members are looking to the community for feedback regarding a possible change to school start times for the 2019-2020 school year. Learn more. It’s important to note that we're just exploring the topic at this time. Many school districts have already made the change to high school start times due to the reported positive impacts on students’ physical and emotional/mental health, particularly at the secondary level. We’ve been watching other districts, learning from their experiences, and reviewing data and research for the past several years. We know there would be benefits and challenges to a change in start times. Ultimately it is up to the school board to consider the pros and cons and determine if this is a change they wish to make. The board will hold a series of meetings in March/April to gather feedback from parents, staff andstudents. Watch for more details coming soon. Please join us to hear what local business and community leaders believe we need to provide our students for them to be successful future citizens and leaders. Community Leader Roundtable: Feb. 12, 2018, 6 p.m. at Oak Glen Golf Club in Stillwater. This is the latest in a series of Community Conversations designed to help us create a Portrait of a Graduate, an important document that will be the foundation of our next strategic plan. Learn more. Can you believe we've had 100 days of school so far this year? Time flies when you're learning and having fun! Schools across the district celebrated the milestone with special parties. 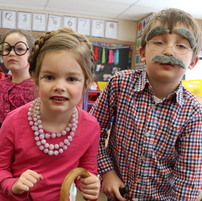 Some students and teachers even dressed up as 100-year-olds. See more photos on Facebook. Congratulations to SAHS senior Noah Schraut who earned the Academic All American award from the National Speech and Debate Association. The award recognizes academic rigor, competitive speech and debate success, and personal excellence. Fewer than 500 students involved in speech and debate nationwide earn this award. This accomplishment places Schraut among the top half of one-percent of all student members across the country. For the first time in school history, Stillwater Area High School competed in the State One Act Play Festival. 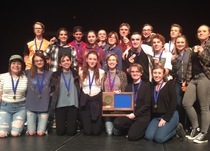 The ensemble (pictured at right) won the section championship with their performance of Metamorphoses. Congrats to our girls and boys nordic ski teams who are both heading to state! The girls won the 4AA section championship, while the boys came in second place. Congrats to the SAHS boys and girls alpine ski teams! They are both heading to state after winning the 4AA section championships. Boys track and field coach Scott Christensen was honored as the Class AA State Coach of the Year. This marks the fourth time Christensen has received this honor from the Minnesota Track and Field Coaches Association. Three student athletes signed National Letters of Intent to compete at the college level. Molly Conners will play soccer at the University of Northern Iowa (D-I), Devontae Hatcher is heading to Southwest Minnesota State University (D-II) to play football, while Olivia Knox will play soccer at the University of North Dakota (D-I). Alum Jessie Diggins goes for Gold! Jessie Diggins (Class of 2010) finished fifth in the skiathlon, the highest placing of any U.S. woman in Olympic cross-country skiing! Diggins is hoping to medal in her stronger events in the coming days ahead. Her next shot is Tuesday in the Individual sprint. Read more. 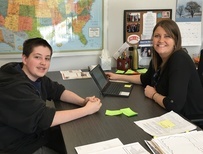 In honor of National School Counselor Week (Feb. 5-9) we recognized the unique work that school counselors and student advocates do at every grade level to help children reach their full potential. They support our students academically, socially and emotionally, and can help them with anything from peer relationships to planning for college or career and everything in between. Thank you, counselors!